Robots.Education is pleased to offer our world class After-School Robotics Programs in Calgary. We use a hands-on, "exploration based" approach in all our programs - resulting in maximum engagement and deep learning for all our participants. Students attending our after-school programs will be learning how to program advanced robotic capabilities, such as speech recognition and visual tracking... they'll even program robots to recognize their faces and greet them by name! 98% of participants would recommend our programs to their friends and families. Click to view testimonials. 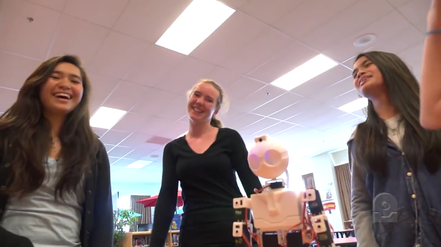 We offer programs within our own classroom, and we facilitate on-location learning with our mobile robotics programs at schools within Calgary and the surrounding area. Check our Events Calendar to see our schedule of upcoming events within Calgary... or if you're interested in having us come to your school to teach an after-school program, Contact Us. We’ve demonstrated robotics to more than 12,000 students from grades 4-12, and following our presentation, 90% of ALL students indicate that they would like to learn robotics (which includes traditional style programming).